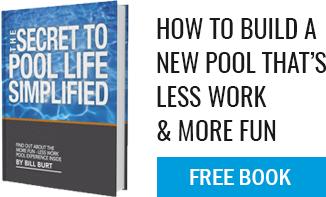 Does the spa make it harder to maintain the pool? No. During normal operation (every day, even when the pool is not used) the spa will filter WITH the pool (it overflows into the pool) so in effect the owners are taking care of “pool water” and not “hot” spa water (it is much more difficult to treat and maintain “hot” water). Because the spa is heated only on-demand, we are treating the pool/spa combo as if it is a pool only. After the spa is used, the valves go “back to normal” and the pool/spa go back to filtering as one body of water. It is by far the best way to plumb a pool/spa system.